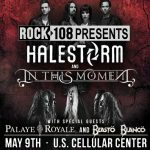 Rock 108 welcomes Halestorm & In This Moment to the U.S. Cellular Center! Thursday, May 9th in Cedar Rapids! With Special Guests Palaye Royale and Beasto Blanco! Tickets are on sale now all Ticketmaster Outlets, Ticketmaster.com, or the US Cellular Center box office!